Through an application filed before the Supreme Court, Former Additional Solicitor General for India and Senior Counsel Ms. Indira Jaising has demanded the removal of certain adverse remarks made against her by the Court in its judgment denying independent probe into CBI Special Judge Brijgopal Harkishan Loya's death. The Court had rejected the Petitions and Intervention Applications (IAs) in the case in April this year. One of the IAs was filed by Admiral Laxminarayan Ramdas who was represented by Ms. Jaising. The Court had opined that the Petitions lacked merit, and that the conduct of the petitioners and the intervenors is "lacking in bona fides and reveals a misuse of jthe udicial process". “...The conduct of the petitioners and the intervenors is, as we have indicated, lacking in bona fides and reveals a misuse of judicial process." Her application, filed through Advocate Sunil Fernandes, now submits that her IA as well as Written Submissions did not contain any averment that could be considered as constituting prima facie contempt. Ms. Jaising further makes an attempt at justifying her prayer for the issuance of contempt notice against the members of the Administrative Committee of the High Court of Bombay which had transferred Special CBI Judge J.T. Utpat in the Sohrabuddin case. She point out that it was the Supreme Court which had directed the Administrative Committee to ensure that the trial is conducted from beginning to end by the same officer. Despite this, she submits that Judge Utpat was transferred from Mumbai to Pune during the trial, without permission from the Apex Court. This, she said, was a "clear prima facie case of disobedience of the order of this Hon’ble Court". She in fact submitted that the prayer for action against the Administrative Committee is "prima facie a tenable and credible argument and is not fanciful of motivated by any malice or intended to interfere with the independence of the judiciary". Ms. Jaising goes on to pray for a direction calling for records of the meeting of the Administrative Committee of the High Court to ascertain the reasons for Judge Utpat's transfer, and to conclusively find out if the Apex Court's permission was taken to transfer him. Besides, she also protests against being held prima facie guilty of contempt due to these submissions, asserting, "The submissions made by the Applicant herein at the bar were well founded and cannot remotely constitute prima facie contempt To do so would deny to the counsel for the Intervenor, the right and duty to raise legal submission as thought fit, and to hold them prima facie guilty of criminal contempt would have, and does have, a chilling effect on the ability of counsel to present the case without fear or favour which they are professionally bound to do." She further objects to the observations contending that the Court made "sweeping generalised observations about all the counsels rather than discussing whether the submissions of each counsel tantamount to prima facie contempt". 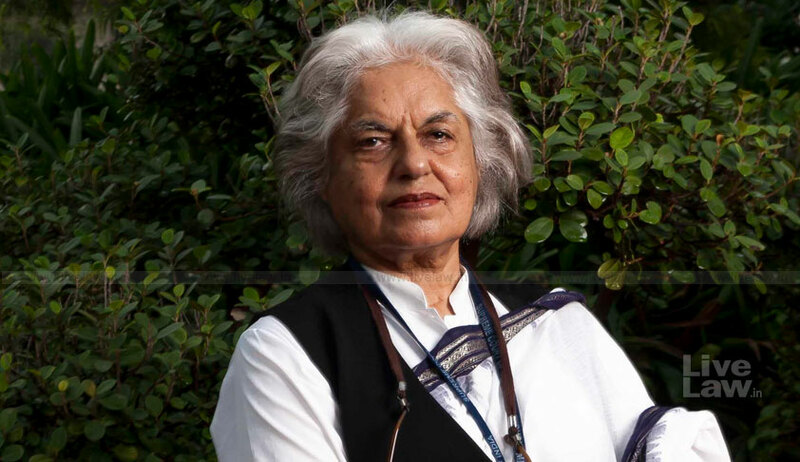 Furthermore, Ms. Jaising points out that she had not been afforded an opportunity to defend herself against charges of criminal contempt by neither issuing a written notice nor informing her of the actions amounting to criminal contempt. With these submissions, she demands expungement of the remarks against her, as well as a clarification to the effect that she did not engage in conduct which amounted to contempt of Court.